Join other weak-signal VHF, UHF and Microwave operators for the 24th Annual PNW VHF Society Conference! We have 65 people registered as of Apr 19, 2019. Ask for the "Pacific Northwest VHF Society" room rates. Not a big discount this year but a discount nonethless. Before calling, you might check rates online with something like Expedia and compare discounts at the same hotel. If a Saturday night reservation is asked for, then a Friday night stay might also be required. 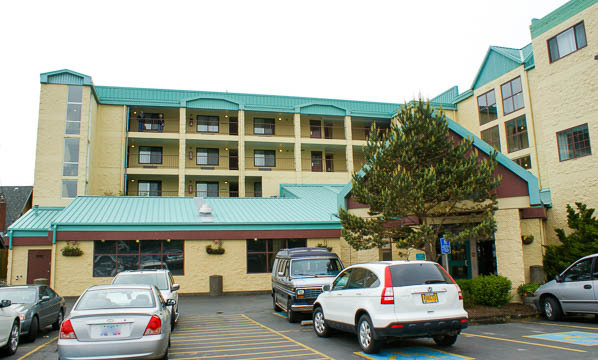 Room reservations need to be through the front desk at 503-738-3334. There is a two night minimum requirement for Saturday the 13th. There are also cheaper places to stay in town. Conference registration is $55 before Oct 1st, or $65 thereafter and at the door. Engraved Logo Society Badge is $15 before Oct 1. Read about the group badge order. Register now! You can check your registration and badge order below. Contact Jim K7ND to make corrections.